Flex Court Athletics is on a mission – a mission to remind Long Island and New York state residents about the game of tennis by transforming courts with modular systems. Dating back to the mid-1800s, tennis is a beloved sport for many and even has its competitive space in the Olympics. No matter your age, tennis is a sport the whole family can enjoy. Play as singles or doubles, but be careful to not make a moonball play so you don’t put your opponent in a bad mood. Another source of bad moods is having a tennis court that needs to be repaired or replaced. Regardless of the amount of usage or element exposure, all clay or concrete tennis courts will need routine repairs or possible replacement every four to five years to prevent permanent damage and deterioration. Flex Court surfaces don’t. When it comes to the court surfacing itself, Flex Court has reinvented the game of tennis. We install modular courts with interlocking sports tiles that are cooler to play on than clay, concrete, or artificial turf surfaces. The secret is in the composition of the tiles themselves. We wanted the surface to provide lateral and vertical support to protect joint impact with FleXion and TraXion technologies. It is also important to us that your surface remain cool despite exposure to the elements. We updated our modular systems with low-heat tiles that are more resistant to the sun’s harmful radiation. Other polymer or acrylic surfaces are prone to absorbing heat and may suffer color fading from constant element exposure. Some applications can even reflect the sun’s UV rays during gameplay, creating a dangerous environment for players. Spring time, equals family time. Stay active with your choice of 18 different splashes of color. Design your backyard’s signature look today. With an unmatched 16-year limited warranty, Flex Court tennis courts set the industry standard for modular court surfaces. Best of all, our modular court systems can be installed over any existing surface. Maintenance is super easy too! You only need to hose it down periodically to keep the surfaces debris-free. From regulation-sized courts to smaller backyard or indoor tennis courts, Flex Courts Athletics has you covered. We give you the entire system from the surface to the perimeter fencing, net systems, posts, lighting systems, and steel-reinforced concrete pads. 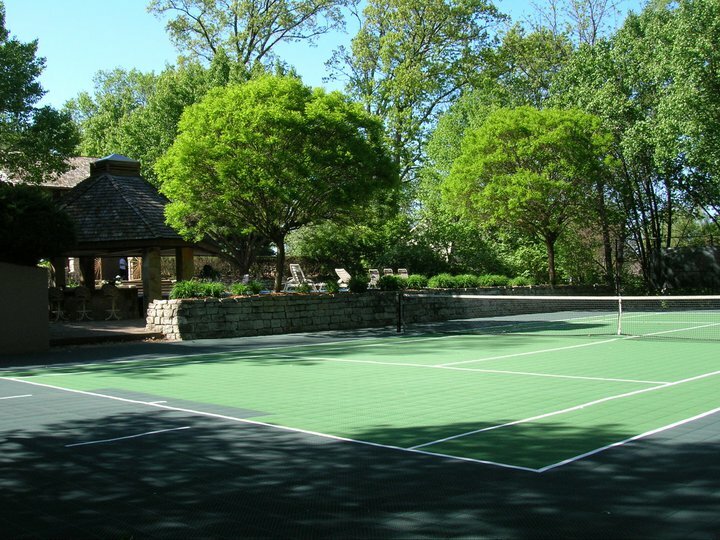 Whether you are requesting a commercial or residential tennis court at your Long Island property, you are sure to ace your game. After all, tennis is supposed to be fun with just a tinge of competition, so go ahead and volley for who is doing the dishes tonight. If you’d like to learn more about Flex Court Athletics of New York, contact our experts today for a free design consultation! This entry was posted in Tennis Courts and tagged indoor tennis court, Long Island, paddle tennis court, residential tennis court, tennis court installation. Bookmark the permalink.